DNA replication goes in the 5' to 3' direction because DNA polymerase acts on the 3'-OH of the existing strand for adding free nucleotides. Is there any biochemical reason why all organisms evolved to go from 5' to 3'? Are there any energetic/resource advantages to using 5' to 3'? Is using the 3'-OH of the existing strand to attach the phosphate of the free nucleotide more energetically favorable than using the 3'-OH of the free nucleotide to attach the phosphate of the existing strand? Does it take more resources to create a 3' to 5' polymerase? Prof. Allen Gathman has a great 10-minutes video on Youtube, explaining the reaction of adding nucleotide in the 5' to 3' direction, and why it doesn't work the other way. Briefly, the energy for the formation of the phosphodiester bond comes from the dNTP, which has to be added. dNTP is a nucleotide which has two additional phosphates attached to its 5' end. In order to join the 3'OH group with the phosphate of the next nucleotide, one oxygen has to be removed from this phosphate group. This oxygen is also attached to two extra phosphates, which are also attached to a Mg++. Mg++ pulls up the electrons of the oxygen, which weakens this bond and the so called nucleophilic attack of the oxygen from the 3'OH succeeds, thus forming the phospodiester bond. If you try to join the dNTP's 3'OH group to the 5' phosphate of the next nucleotide, there won't be enough energy to weaken the bond between the oxygen connected to the 5' phosphorous (the other two phosphates of the dNTP are on the 5' end, not on the 3' end), which makes the nucleophilic attack harder. Watch the video, it is better explained there. 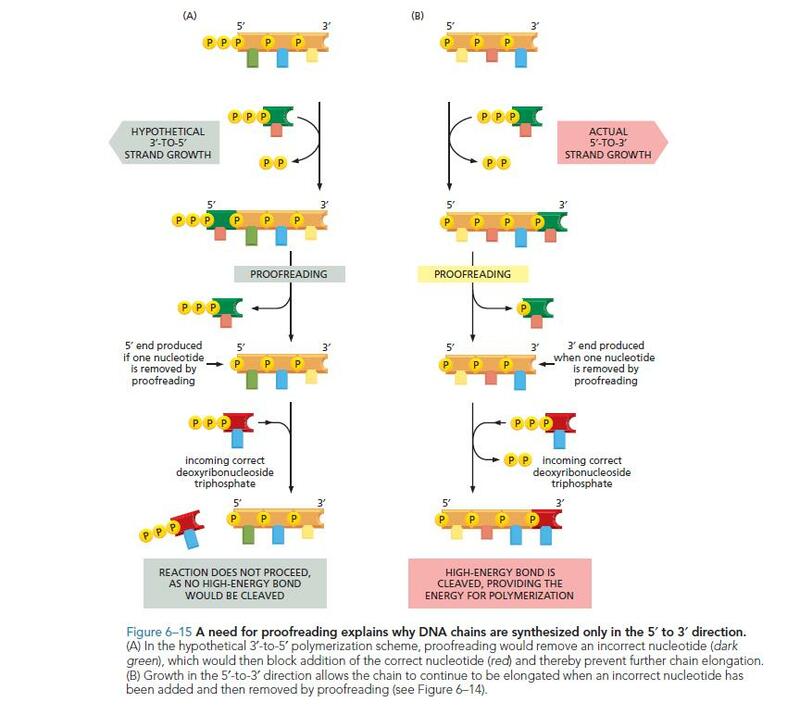 DNA replications needs a source of energy to proceed, this energy is gained by cleaving the 5'-triphosphate of the nucleotide that is added to the existing DNA chain. Any alternative polymerase mechanism needs to account for the source of the energy required for adding a nucleotide. The simplest way one can imagine to perform reverse 3'-5' polymerization would be to use nucleotide-3'-triphosphate instead of the nucleotide-5'-triphosphate every existing polymerase uses. This would allow for a practically identical mechanism as existing polymerases, just with different nucleotides as substrates. The problem with this model is that ribonucleotide-3'-triphosphates are less stable under acidic conditions due to the neighbouring 2'-OH (though this obviously only applies for RNA, not for DNA). So any 3'-5' polymerase would likely need to use the same nucleotide-5'-triphosphates as the 5'-3' polymerase. This would mean that the triphosphate providing the energy for addition of a new nucleotide would be on the DNA strand that is extended, and not on the newly added nucleotide. One disadvantage of this approach is that nucleotide triphosphates spontaneously hydrolyze under aqeuous conditions. This is no significant problem for the 5'-3' polymerase, as the triphosphate is on the new nucleotide and the polymerase just has to find a new nucleotide. For the 3'-5' polymerase spontaneous hydrolysis is a problem because the triphosphate is on the growing chain. If that one gets hydrolyzed, the whole polymerization needs to be either aborted or the triphosphate need to be readded by some mechanism. You can take a look at the article "A Model for the Evolution of Nucleotide Polymerase Directionality" by Joshua Ballanco and, Marc L. Mansfield for more information about this. They created a model on early polymerase evolution, though they don't reach any final conclusion. In my opinion, Prof. Allen Gathman's "great 10-minutes video on Youtube" is a pretty waste of time if you already know how hydrolysis happens. In fact, he has not considered the 3'->5' route in an unbiased manner; he doesn't seem to look at the possibility of a triphosphate appearing at the growing 5' tip of the strand in the 3'->5' case. Actually, the only difference between the two routes (5'->3' and 3'->5') is that the reacting triphosphate appears in different places. In the usual case, the triphosphate which is hydrolysed belongs to the added nucleotide, while in the latter case, the triphosphate which is hydrolysed belongs to the nucleotide on the growing strand. Both are feasible. The other important consideration is repair. If one or more nucleotide is missing in one strand, repair of the missing nucleotide would be impossible for 3' to 5' synthesis, because no 5'-triphosphate is present. On the other hand, 5' to 3' synthesis does not require a 3'-triphosphate present at the repair site. This is important. That is 3' to 5' synthesis does not allow nucleotide repair. Actually there is a polymerase that catalyzes 3' - 5' elongation. See for example the Thg1 superfamily. "Doing it in reverse: 3'-to-5' polymerization by the Thg1 superfamily." Jackman, et al. Not the answer you're looking for? Browse other questions tagged dna replication polymerase or ask your own question. Is blunt end repair and A-tailing necessary when adaptors can be custom made?